This is a guest post written by Jessica Thiefels. Want to contribute? Check out the 2018 publishing calendar. “Reviewing now provides more time to implement changes. If you want to make changes, such as ordering new inventory, hiring and training a new employee or launching a marketing campaign, it will take time to get those things rolling. So it’s better to start now rather than waiting until fall,” suggests Score.org contributor Daniel Kehrer. 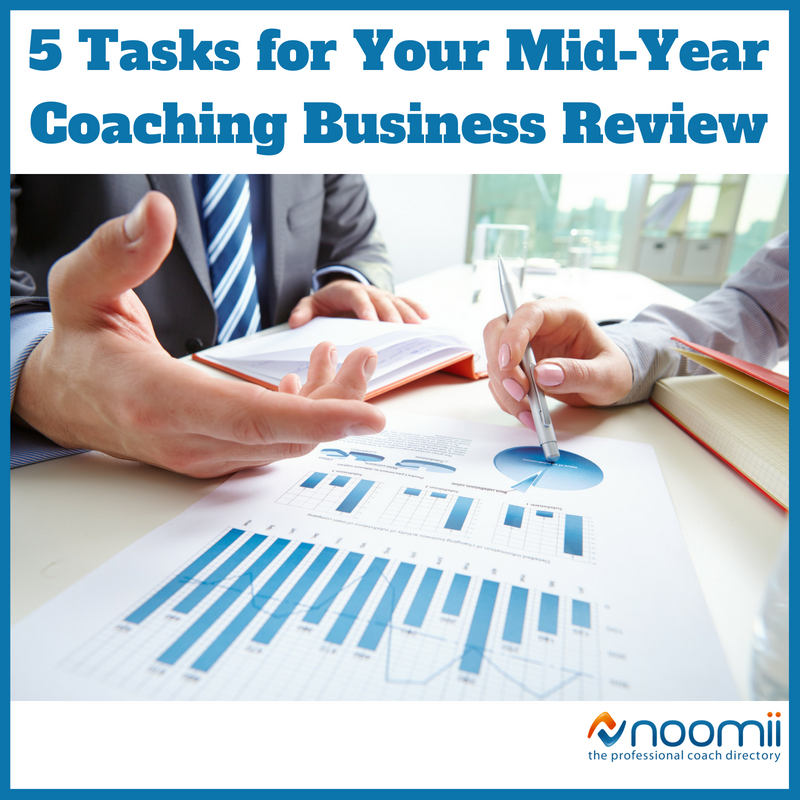 Use the following tasks to do a mid-year review of your business. Figure out what’s working and what should change, and then use our action steps to start implementing those ideas this week. Part one of your goal check-in is to assess what you already set out to do, at the beginning of the year, the previous quarter or otherwise. When doing so, ask yourself: Have I made progress? If not, what’s going wrong? If so, what did I do right? Business savvy: Is the second half of the year a good time to get some business mentoring or coaching of your own? Perhaps now is a great time to embark on a new specialty certification. Networking: If we work in a silo, we have a hard time learning from others’ experiences. A great mid-year goal may be to find more networking opportunities. You don’t have to go to expensive conferences; consider small, local groups that get together for coffee once a month, for example. Something like the latter requires less commitment while still offering a chance to learn and grow. Action steps: Block at least one hour on your calendar in the next week. Write out your current goals, where you’re at with each one, and what you’d like to focus on moving ahead. If you don’t write it down, it’s just an idea. Put it on paper (or in a Google Doc). As a coaching professional, insurance is critical to keeping you and your business safe. If a client takes legal action against something you’ve recommended, for example, insurance ensures that your business is protected. The first step is to get on the phone with your insurance agency and walk through your current coverage. Are there gaps since you first set it up? Are there ways you could be saving money? Don’t forget to ask about ways to improve your current insurance offering. For example, adding cyber liability insurance may be wise a wise business decision. Cybersecurity is more important now than ever before and small businesses and business owners are at even greater risk than large enterprises. Why? With fewer personnel, and likely minimal security, you’re easy to hack. Cyber liability is the best way to protect yourself. Not only do most antivirus programs fall short of full protection (70% of threats go undetected), but simply telling your team, “Don’t access this data,” or “This folder is for me only” still leaves you at risk—especially if you work with freelancers and contractors. “Particularly in small businesses, where there are only a few employees, and there may not be a full-time IT staff, it can seem simplest to just tell employees not to access anything that isn’t relevant to their job. This is very risky, however; more than one employee has stolen information on their way out of a job with the intention of selling business information to a competitor,” suggests business insurance experts. The good news is, most insurers offer this coverage, and it can likely be added on to your current errors and omissions or other liability coverage. Action steps: Schedule a call with your insurance agent in the next two weeks. Give yourself a deadline, put it on the calendar and make it happen. 82% fail because of cash flow challenges. 29% fail because they run out of cash. If you have concerns, or struggle with managing your finances, now may be a good time to find an accountant, if you don’t already have one, or make an appointment to see yours. Accountants are available for consulting year-round, and they’re the perfect people to help you get finances in order before you’re in a no-win situation. You can also reach out to your local or preferred bank. Most credit unions offer free financial consultations and counseling, and many banks (credit unions and otherwise) also offer mid-year financial strategy seminars. Action steps: A financial overview will likely take a few days, as you dig in between running your business. Start by making an appointment with your accountant; if you don’t have one, ask for referrals and make an initial appointment. Most coaching businesses experience some type of seasonality throughout the year. Alternate streams of revenue are a great way to keep your business thriving during slow times of the year. You may even be able to earn passive income during the busy season, allowing you to increase revenue exponentially as a whole. Once you know what revenue stream would be most complementary to your business, consider what it will take to get it done— hiring freelancers, making time on the weekends, scheduling the project for the fall, etc. Can you do this by the end of the year? If not, when? With a plan in place, you’re more likely to follow through. Action steps: Start by simply researching revenue streams for coaches. Ask friends within the industry if they’ve done the same, and if so, what resources they recommend. A SWOT analysis is one of the easiest ways to get an honest read on your business, while planning for the future at the same time. It stands for “Strengths, Weaknesses, Opportunities, Threats.” This makes it a great task for your mid-year business review, allowing you to think openly and honestly about what’s been going right, what’s gone wrong, and what the next 6 months look like. Action steps: Go through every section of your business, or your business as a whole, asking yourself: What are my current strengths here? What are my current weaknesses? What are the opportunities I foresee? What are threats I can expect? To get started, check out MindTool’s SWOT Analysis Guide, which includes a free template download. Now’s the time to see what’s working and what’s not, and make changes to turn things around or ramp them up. Use these ideas to assess your business at every angle, from finances and goals to insurance and revenue. You’ll feel great heading into the second half of the year with fresh plans and a commitment to making your coaching business the best it can be. Jessica Thiefels has been writing for more than 10 years and is currently a full-time writer, content marketing consultant and business owner. She’s been featured in Forbes and Business Insider and has written for Manta, StartupNation, LeadPages Salesforce and more. Follow her on Twitter and connect on LinkedIn.